Once upon a time, I ran a vegetarian restaurant in a college town, and one of its signature dishes was the “Big Veg.” The Big Veg was a scratch-made soy veggie burger. I get tired of beef burgers and sometimes want to incorporate more plant-based meals into my diet. For these reasons, I love the idea of a vegetarian alternative to the standard beef burgers of summer. I turned to black beans as the base. I was tempted to veer toward Southwestern/Mexican spices since they’re such a good pairing with black beans, but ultimately decided against that obvious flavor profile so that the condiments could shine. No, this is not like a beef burger, but yes, this is a winner in the vegetarian category: it’s full of vegetable flavor, it is filling, and it is not painstakingly time-consuming to make. Compared to hamburgers, which you can buy already formed into patties, these veggie burgers take a little more time. But by the time you pull all the ingredients together, you are only looking at about 15 minutes of total prep with the aid of a food processor. First, pulse the vegetables to break them down a bit then throw them in a skillet to cook. While they are cooking, make soft breadcrumbs (no need to bother with cleaning the processor). Finally, chop the beans in the processor, and stir them, the veggies, and the breadcrumbs all together with a beaten egg. Cover the mixture and refrigerate for at least an hour, then form into patties and cook! Do you have an extra five minutes? They will be well spent if you cook the vegetables and dry the beans with a paper towel. This step ensures the burgers won’t be mushy because some of the water will be released from the veggies, plus the flavors of vegetables mellow from cooking. Poblano peppers add some earthy spice to these burgers, and soften pleasingly when cooked first. In general, they are mild, but every once in a while a rogue hot one pops up, so be sure to taste the pepper before you add it, and cut back if it is too spicy for your taste. If you can’t find them, substitute Anaheim peppers or just plain old green bell peppers. Onions and garlic lose their raw and sometimes jarring flavor and become sweetened by cooking. In addition, zucchini adds a creamy texture, but it can make your burgers soggy if it’s not cooked before adding it to the burger mix. This recipe makes four large, filling burgers, suitable for hungry folks. One of these with all the add-ons and a bun makes a substantial meal all by itself. If you want smaller burgers, say for lunch, you will end up with four to six burgers, depending on the size you want. Once shaped, the patties will keep in the fridge for a day or two—stack them between layers of parchment and wrap them in plastic. You could also freeze them: Spread them on a parchment-lined baking sheet and freeze, then stack them with parchment squares in between and enclose in a plastic freezer bag. Let them sit out at room temperature to partially (25 to 30 minutes) defrost before cooking. Finally, the cooked patties do well reheated—brown them in a skillet, refrigerate them, and reheat them later in the oven with the cheese on top. It’s a handy way to make them ahead if you are having friends over. I prefer to make these in a skillet, but they could be grilled if handled carefully — they are more fragile than a meat burger. I’d recommend chilling the burgers in the fridge for about an hour before grilling. In either case you need plenty of oil (in the pan or on the grill grates) and medium heat. The burgers need time to heat all the way through and if the heat is too hot, they will brown on the outside but stay cool in the middle. The spicy mayonnaise I’ve created for these burgers is mildly hot with a sharp punch of lime. If you like more spice, add more chili powder, or substitute finely chopped chipotle chilies in adobo to taste. With flavorful beany burgers, and onions, tomato and avocado as toppings, you already have a feast—but the spiced mayonnaise makes them sing. MORE SUMMERTIME MEATLESS MAINS TO TRY! Tell me, what’s your favorite summer salad? If you said panzanella, you’re at the right place. If you didn’t say panzanella, that’s ok too, because I think you’ll be converted after you try this one! ? It’s the ultimate summer salad to make with a bounty of fresh tomatoes. Or in this case, if you have a few tomatoes and a bounty of fresh sweet corn. 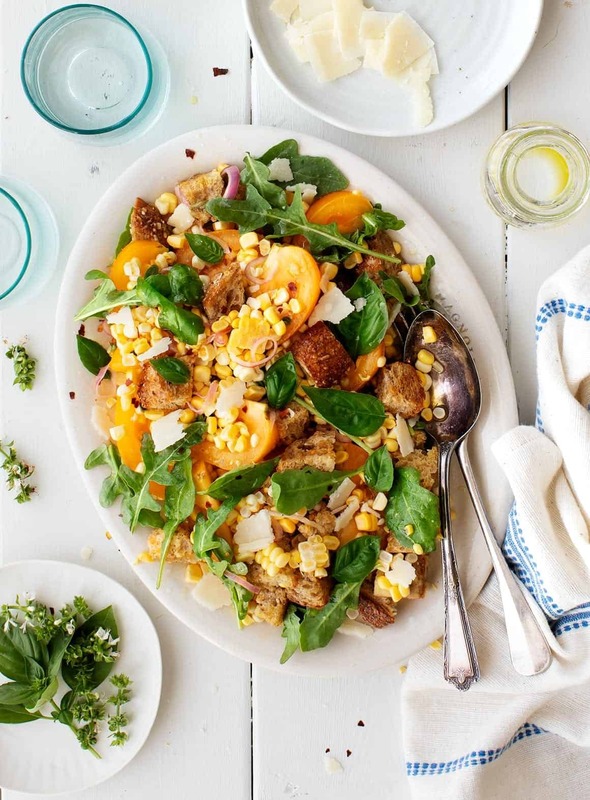 Panzanella may be an Italian bread salad, but the special part about this panzanella is that it’s not entirely about the bread. I think bread salads can often get a bit too bread-y, which is where the corn comes in. It’s fresh, crisp, and it soaks up the tangy vinaigrette and tomato juices so well. 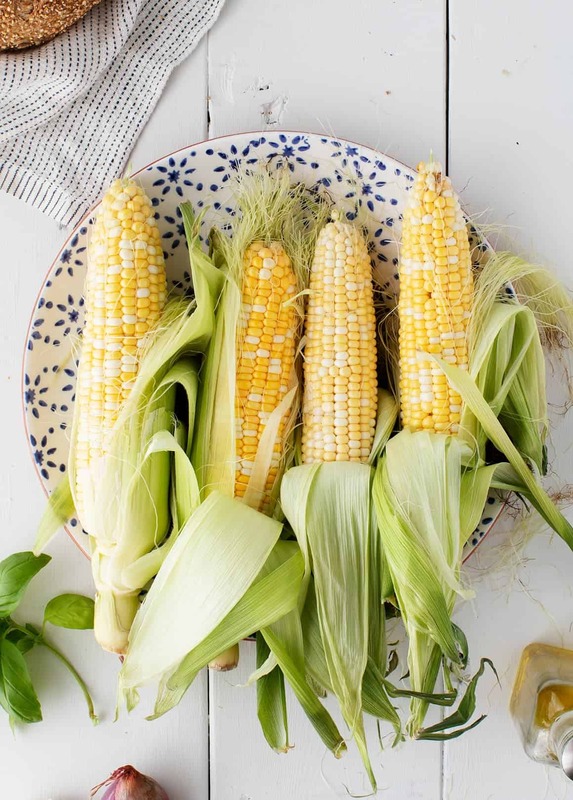 Plus, corn is my favorite summer vegetable and it’s just now coming into season, so I’ll be eating it pretty much every day from now until the end of September. Did I mention that this salad comes together in just one bowl? It’s great to make ahead and it’s the perfect side dish to go with whatever you’re grilling. If you have a bit left over, it makes a great lunch the next day by adding some chickpeas and another handful of arugula. In a large bowl, mix together the olive oil, vinegar, mustard, salt, shallot, and garlic. Set aside. Arrange the bread cubes on the baking sheet, drizzle with olive oil, and toss to coat. Bake until toasted, about 8 minutes. To the large bowl, add the corn, tomatoes, toasted bread, arugula, a few pinches of red pepper flakes, and toss. Season to taste with flaky sea salt (or regular sea salt). Spread onto a platter and top with the basil and shaved cheese, if using. Serve. Make-ahead note: If you’re not serving this right away, mix every ingredient together except the bread, arugula, basil, and cheese. Add the bread and arugula 15 minutes before serving so that the bread does not get too soggy, and the arugula does not wilt. Top with the basil and cheese as you’re ready to serve. This spicy and slightly sweet grilled salmon is bound to become a favorite this summer. Smoked paprika, garlic, and onion powders in the rub create a savory, smoky flavor, while a touch of sugar adds a hint of sweetness and helps the skin become unbelievably crispy. As if that weren’t enough, the salmon is topped off with a peach and avocado salsa, which compliments the richness of the salmon. The peaches and avocado also contribute a velvety quality to the whole dish. Grilled salmon is one of my favorite foods ever, but for years I shied away from making it because the fish would stick to the grill and fall apart. For me, the best solution to this problem has been using a good nonstick grill pan, which sits right on top of the grates. Grill pans are perforated on the bottom, so you still get the classic flavor of cooking over open flame, but you also avoid the tragedy of fish getting stuck to the grill. If you can’t find a nonstick grill pan, use a stainless steel one and rub it liberally with oil before laying on the salmon. Next to a grill pan, preheating the grill is the most important part of this recipe. Getting your grill really hot means you get golden caramelization on the fish and crispy salmon skin (my favorite). Don’t skip this step. It is worth every second of the 15 minutes. Turn the heat to high and close the lid! I like to season and refrigerate my salmon, then get the grill going, and then make my salsa at a leisurely pace while the grill heats up. You may even have time for a cocktail or glass of wine while you wait. Fruit salsa is a very popular pairing with fish, and one that I come back to over and over. Salmon’s bold richness pairs well with the sweetness, heat, and acidity of this peach salsa. When choosing your peaches, look for a ripe but still firm peach to contrast the texture from the creamy avocado. The peach’s slight tartness balances the rich fish and avocado. You can make the dry rub in advance; you may even consider making a large batch so you have it on hand for other meals. It will keep indefinitely at room temperature when stored in an airtight container. This particular mix of spices tastes great on everything from summer squash to steak. You can make the salsa up to eight hours in advance. Just wait to add the avocado until you’re ready to serve—adding it at the last minute keeps it from turning brown or getting mushy. You may also consider making a larger batch of the salsa, as it goes great with chips. Paleo friends! Swap in maple sugar for the light brown sugar in this recipe for a paleo-friendly summer dinner. 1 Season the salmon: Whisk together paprika, garlic, onion, maple sugar, salt, pepper, and cayenne. Sprinkle spice mixture evenly on all sides of the salmon. Refrigerate uncovered while making the salsa and preheating the grill, about 20 minutes. 2 Make the salsa: In a medium bowl, mix together the peaches, avocado, onion, cilantro, jalapeño, lemon juice, and salt. Season to taste, adding more salt or jalapeño if you like. If your peaches are a bit tart, you can add a pinch of sugar. 3 Prep the grill: Preheat a gas or charcoal grill to 500ºF for at least 15 minutes, or until you can hold your hand above the grates for 2 to 3 seconds. 4 Grill the salmon: Brush all sides of the salmon with oil—about a tablespoon total. Brush a bit of oil onto the grill grates as well, ensuring that any fish touching the grates through the grill pan will easily lift away. Place the salmon skin side up on the grill pan and transfer the pan to the grill. Close the lid and cook undisturbed for 2 to 3 minutes. Using a fish spatula or tongs, gently lift one corner of the fish. The grilled side should be opaque and show some sear marks. If not, check every minute or so until it is. 5 Serve: Remove from the grill and serve immediately. Top with peach salsa and cilantro and chilies for garnish. Hello! All photos and content are copyright protected. Please do not use our photos without prior written permission. If you wish to republish this recipe, please rewrite the recipe in your own unique words and link back to Grilled Salmon with Peach Salsa on Simply Recipes. Thank you! Looking for a healthy caesar salad dressing? 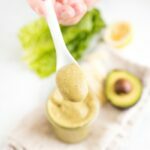 This avocado caesar dressing uses avocado instead of eggs so it’s still super creamy and flavorful, but low in calories and fat. Less than 60 calories per serving! I feel like caesar salad is something you either love or you hate. 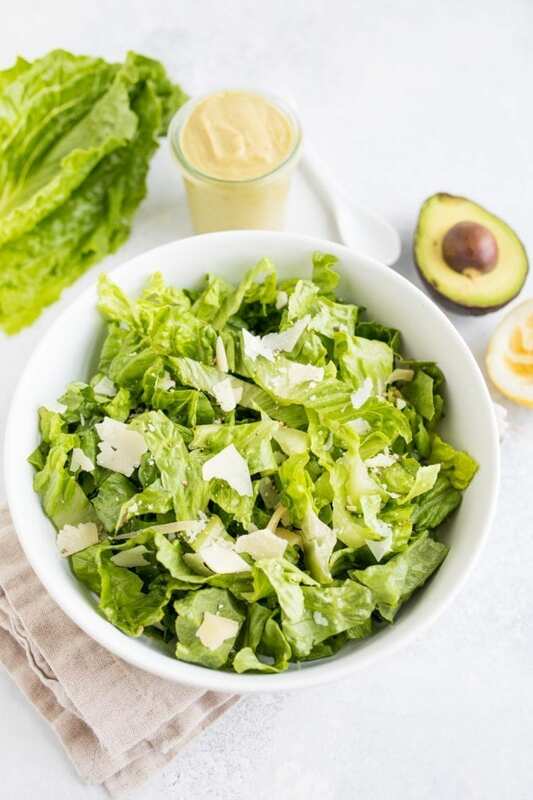 Or maybe everyone loves it… I just know I’ve never been a huge caesar salad person myself, maybe because when I first started eating healthier I learned that caesar salads weren’t exactly “healthy”, so I spent years avoiding them. Typically, caesar salads are high in calories and fat and don’t have much nutrition because they’re made with just lettuce, cheese and croutons. 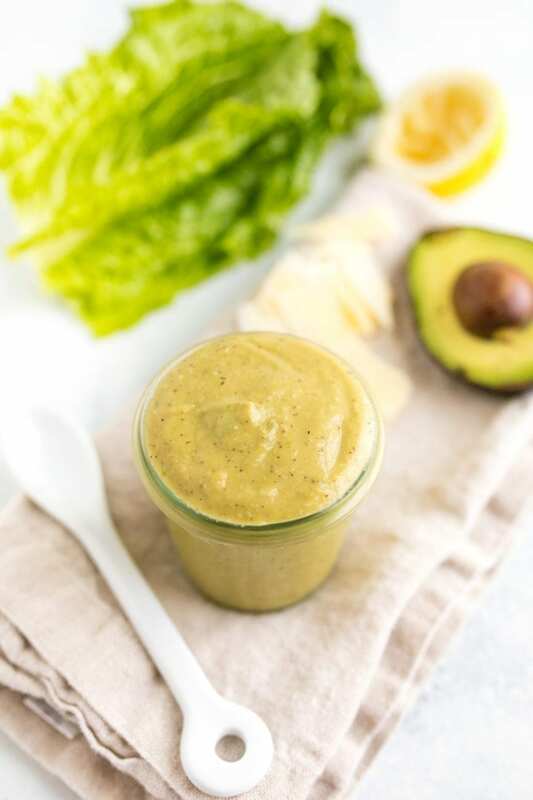 But to my own surprise, I recently created this dressing and a totally epic, EBF-friendly caesar salad (recipe coming soon) and can now say I’m hooked! I can totally see why people like the taste of caesar salads. 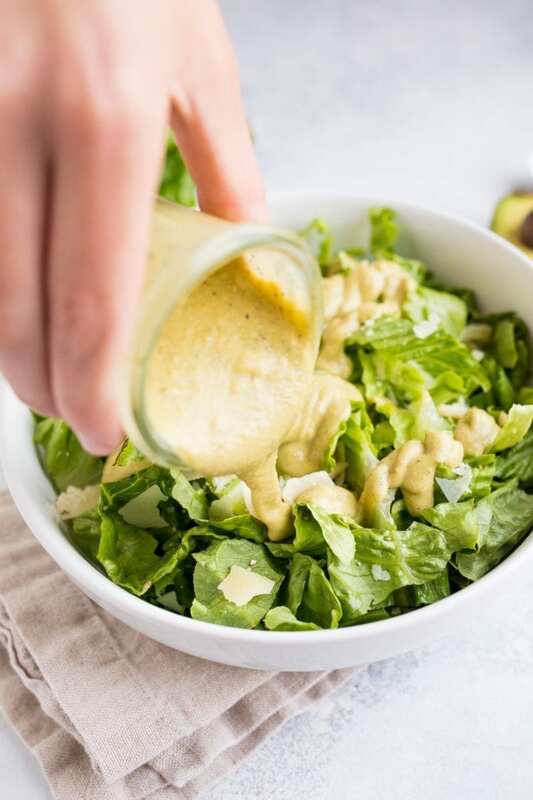 When it comes to caesar salad dressing , it’s typically made with eggs and loaded with processed oils, but I’ve created a delicious, healthier avocado caesar dressing that’s creamy and light but still packed with all the caesar flavor you love. 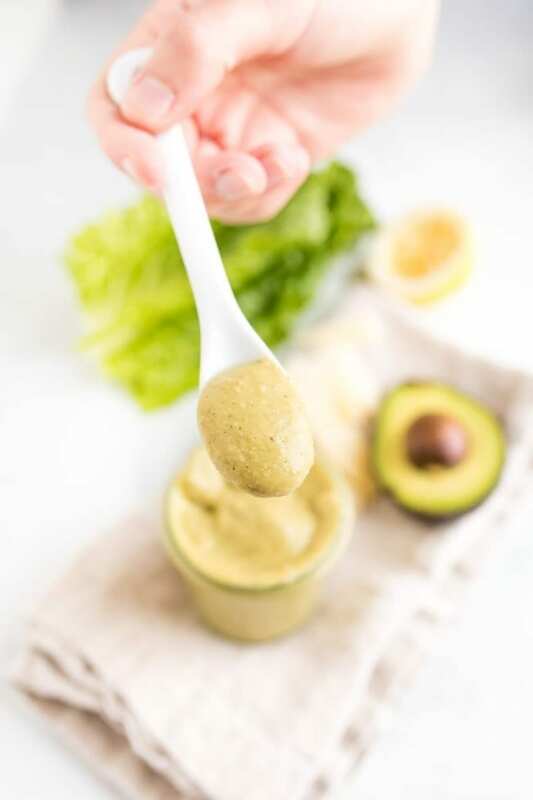 Bonus points: this dressing couldn’t be much easier to make – just throw everything into a blender or food processor and blend until smooth! No separating egg yolks, no whisking — bada-bing, bada-boom. Let’s talk about the elephant in the room: anchovies. I know they’re scary and a little weird, but let me tell you – they are nutrition powerhouses and are what gives caesar dressing that unique flavor! They are high in omega-3 fatty acids, which are really important in the standard American diet. They are also high in calcium and vitamin K, which help with bone health (yes please!). Last but not least, they pack a surprising punch in the protein department (1 serving of anchovies has 13 grams of protein)! If you’re freaked out by using anchovy fillets, you can also use anchovy paste (found in your grocery store near the tuna) — whichever is easier for you! Are you a caesar salad lover? If so, try this dressing and let me know what you think! Add all ingredients into a high powered blender or food processor and blend until smooth. Taste and add additional salt and pepper if needed. If you try this dressing, please leave a comment and star rating below. Your feedback is helpful for us here at EBF and other EBF readers who plan to make the recipe! The post Avocado Caesar Dressing appeared first on Eating Bird Food. Warm weather conjures images of nights spent outdoors, sitting around a campfire surrounded by friends. And with that image usually comes s’mores. The crunchy graham cracker crust contrasts the cool chocolate pudding filling. But the gooey marshmallows—toasted under the broiler not a campfire, in this case—will have you coming back for more. This riff on Simply Recipes’ classic chocolate cream pie starts with the graham cracker crust, which can either be store bought or homemade. The next step is a modified version of our microwave chocolate pudding. I used standard cocoa powder and semi-sweet (56%) chocolate in this recipe (because that’s what was available at my grocery store), but feel free to go with a higher cocoa percentage for a richer filling. If you’re feeling a bit skeptical about making pudding in the microwave (I was at first, because in my mind, microwaves are meant for reheating and not cooking! ), you’ll love this recipe — it’s very easy and fool proof. The only part of this entire recipe that you really need to take into consideration is the amount of time it takes for the pudding to set. As such, I’d recommend filling the pie crust the night before you plan to serve it the afternoon of the next day, or first thing in the morning if you plan to serve it that night. To finish the pie, top the pie with some marshmallows and place it under the broiler until it gets nice and toasty on top. You’ll want to keep a keen eye on this as it can go from beautiful to burned very quickly. Alternatively, you can freehand it with a kitchen torch if you happen to have one in your arsenal. For extra flourish, I topped the pie with some broken graham crackers and chocolate curls, the latter of which I made by simply running a vegetable peeler along a bar of chocolate. Now comes the hard part: slicing. It’s going to be messy. The combination of a crumbly crust, pudding, and marshmallows does not make for picture-perfect slices. However, if you coat your knife with nonstick spray it really helps to cut through the marshmallow layer so that you get less of a mess. It also helps if you angle your slices so they go between adjacent marshmallows instead of through them. The crust will soften the longer it sits because the chocolate pudding is so moist, so I’d recommend eating this pie within 12 or so hours after making it for the best results. It still tastes great scooped into a bowl for a couple days after, but it becomes more parfait than pie at that point. Whether you’re sitting around a campfire under the stars or at your dining room table, this is a crowd-pleasing dessert that’s great for the summer (or any other time of year). Hope everyone is having a great weekend, if you have any suggestions for recipes you want to see next week, let me know! I included the famous Bagel Recipe and Chickpea Egg Salad to make ahead on Sunday so you’ll be ready for the week. ***This is just a guide, women should aim for around 1500 calories per day. Here’s a helpful calculator to estimate your calorie needs. I’ve left plenty of wiggle room for you to add more food such as coffee, beverages, fruits, snacks, dessert, wine, etc. It’s summertime, and the livin’ should be easy! And easy it is with these make-ahead foil packs that you can throw on the grill after a long hike or a day at the beach. The idea is simple: Choose any fully cooked sausage that you like—bratwurst, flavored chicken sausage, kielbasa, Italian smoked sausage. Just check the package label says it is fully cooked. Cut the sausage into pieces along with some vegetables. Enclose the sausage and veggies in foil packets and grill. The contents of your package are ready to eat right off the grill. No knives needed! To make packets like these, I like to use heavy-duty foil because it’s thicker and doesn’t tear as easily. Pick a wide roll, which is easier to form into packets—if you’re stocking up for the summer, this is the size to buy. After assembling the packets, I like to flip them over and cook them with the folded side of the packet downward, against the grill grates. This side is thicker (because of the folds), which insulates the food just enough for everything to brown but not burn. Don’t forget to poke a few holes in the top of the packet for steam to escape. When you are ready to serve the packets, simply cut a large cross in the top of the packet and fold the corners back. Set the packets on paper plates (easiest) or transfer the contents to plates or a large platter. Remember, it’s summertime and the livin’ should be easy, right? Hello! All photos and content are copyright protected. Please do not use our photos without prior written permission. If you wish to republish this recipe, please rewrite the recipe in your own unique words and link back to Foil Packs with Sausage, Corn, Zucchini and Potatoes on Simply Recipes. Thank you! 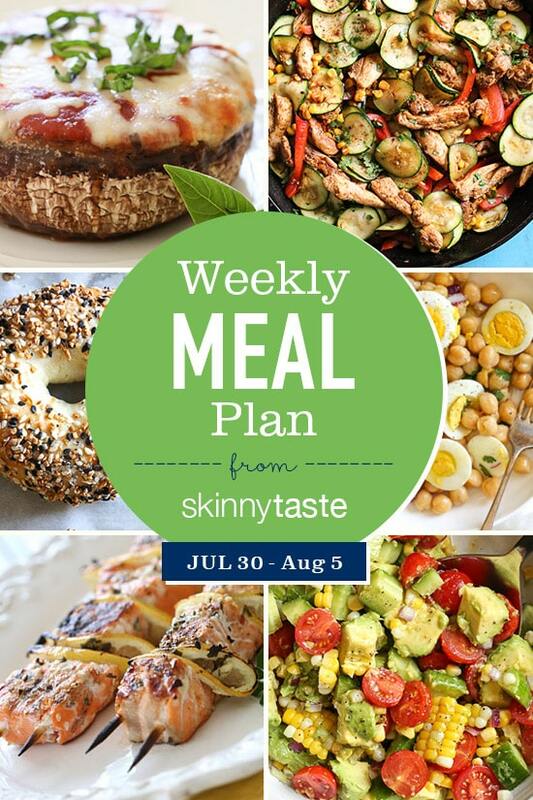 This month, Summer Miller is back, sharing her meal plans for July. Summer is a mom, a full-time food writer, and also helps test the fabulous recipes we bring you every week at Simply Recipes. With that in mind I want to make the most of these final carefree days. My garden is packed with tomatoes, basil and cucumbers at this point in the season, and this week’s meal plan puts them all to good use. 1 Marinate the chicken: In a medium glass baking dish, whisk together the buttermilk, dill pickle brine, hot sauce, smoked paprika, salt and pepper. Add chicken and turn to coat. Cover and refrigerate for at least 4 hours or overnight, turning occasionally. 2 Meanwhile, make the pesto: Bring a medium pot of salted water to a boil. Add the collard greens and cook for 8 to 10 minutes, or until tender. Drain well in a colander and let cool for 10 minutes. Add the collard greens and remaining pesto ingredients to a food processor, and pulse until it forms a course puree. Refrigerate until you are ready to bake the chicken. 3 Prepare the chicken coating: Preheat the oven to 400°F. Line a rimmed baking sheet with foil and lightly coat with cooking spray. In a food processor, pulse pecans until they resemble the texture of coarse cornmeal and pour into a shallow dish. In separate shallow dish, whisk together the flour, salt and pepper. In another separate shallow bowl, place egg whites. 4 Coat the chicken: Drain and discard chicken marinade. Pat chicken dry with paper towels. Lightly dredge chicken in the flour, then into the egg whites and finally into the pecans, coating thoroughly. Place chicken on the foil-lined baking sheet and spray tops lightly with cooking spray. Bake for 18 to 22 minutes or until chicken is cooked through. 5 Meanwhile, make the cornbread grits: Crumble the cornbread into coarse crumbs and transfer to a bowl along with the milk and broth. Stir gently to moisten. For super creamy grits, blend in a blender until no lumps remain. Transfer this mixture to a medium saucepan. Cook over medium heat until thickened like grits, stirring often. Remove from heat and stir in the cheddar, salt and pepper until smooth. Fold in pimientos. 6 Make the hot pecan oil: In a small bowl, whisk together all ingredients for the hot oil except honey until combined. Pour 1 tablespoon of the oil mixture into a small bowl with the honey, whisk briefly to combine, and set aside. Pour remaining oil into a small skillet and heat over medium for 2 to 3 minutes or until heated through, whisking often. 7 Plate and serve: Spread 2 to 3 tablespoons pesto around the outer edges of each of two serving plates. Spoon about 1 cup of grits in the center of each plate. Carefully place chicken in the skillet with the hot oil. Spoon more oil on top. Place one piece of chicken over each plate of grits. Drizzle reserved honey-oil mixture over chicken, allowing any excess to drip over the edges. Garnish chicken with dill pickle slices.